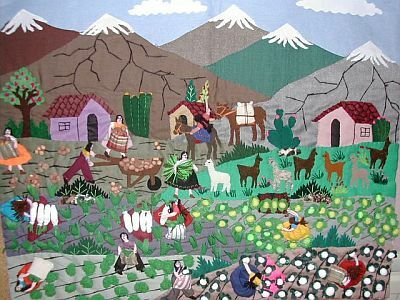 Someone on the Quiltart list was talking about arpilleras of Peru a while ago. Then, serendipitously, someone at church who had been to Peru was taking orders for them. So here’s mine!! And what is nice is that there is a little message in Spanish tucked into a secret pocket on the back telling me about it.